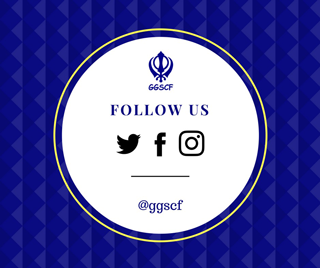 The Guru Gobind Singh Children’s Foundation (GGSCF) was established by children and youth in 1999 as a way to celebrate the 300th Anniversary of the Khalsa and to honour the tenth Guru of the Sikhs. The origins of the youth group in Scarborough Gurdwara who took up the initiative to establish the foundation go back to 1993 when a 50km charity relay run-a-thon was organized for the Hospital for Sick Children. Some of the younger children, as they grew up, then repeated the run in 1997 in support of the Canadian Cancer Society. The spirit from this run was then captured and energies were directed into the celebrations of the 300th anniversary of the Khalsa that was about two years away. At a special meeting held on May 18th, 1998 some 50 children/youth and some parents helped to choose the name of the foundation and set a general direction. The feeling was that we need a foundation which could help those in need on an on-going basis rather than having one-off events, that would be recognized in the larger community, and where the children and youth could focus their energies and do sewa as a way of showing the world the spirit of our Gurus that is in each of us. On July 3 to 5, 1998 an Akhand Path was held to obtain the Guru’s blessings for the effort. On January 23, 1999 the GGSCF held its first event to celebrate the 300th anniversary of the Khalsa in the form of a dinner where plans for the 500km charity relay run-a-thon from Toronto to Ottawa were presented. Then from July 11 to 17, 1999 children with the help of older youth and parents completed the relay run that started Dixie Gurdwara and finished on the steps of Parliament Hill in Ottawa. Over 300 children took part, of which 51 children and youth ran all seven days. On the journey and with every step of the 582 km route to Parliament Hill the children and youth showed the spirit of the Sikh Gurus and thereby established the GGSCF with the blessings of WaheGuru.